Dental Implants are the latest innovation to replace a missing tooth or a number of teeth. An implant consists of an artificial titanium rod which is placed directly into the jaw bone and acts as a replacement for the root portion of the natural tooth. The implant is made using titanium which allows new bone cells to grow around it: the implant then integrates with the newly formed bone which firmly locks it into place. This process is called ‘Osseointegration’. 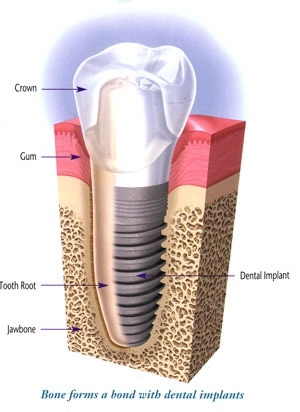 One tooth – One implant will be placed, a crown will then be fixed on top of the implant. Several teeth – Either several implants and crowns will be placed or a dental bridge will be fitted onto the implants. All the teeth – A number of implants are placed, then either a fixed bridge will be fitted onto the implants or the implants will be used to firmly hold a removable denture. A consultation appointment is necessary see if you are a suitable candidate for dental implants and to explain the process of placing an implant. X-rays may be taken and impressions (molds) of your teeth. A treatment plan will then be drawn up detailing all the appointments required and the cost. You will be given a local anesthetic to numb the area around where the Implant is being placed. For patients who are anxious sedation can be given. An incision is made in the gum where the implant is going to be placed, to expose the bone; a small hole is then drilled into the jaw bone. The titanium implant screw is inserted into the bone. A protective cover or ‘healing cap’ is placed over the top of the screw. This is either left visible in the mouth, or if the implant is deep in the jaw bone the gum will be stitched over the healing cap. This is left for 3 to 6 months to allow new bone to integrate with the implant allowing osseointegration to happen. If osseointegration does not occur the implant will fail. On occasion it may be necessary to place a temporary crown or bridge for a few months to allow the gum to heal fully before the permanent restoration can be fitted. Good oral hygiene and regular check-ups with the dentist and hygienist are a very important part of looking after your implants as the gums need to remain healthy. The implants can then last a lifetime.